For 5 to 14 year olds. Courses are aimed at both Boys and Girls with the option of attending for as many days as you wish during the period of the course. They run during half terms and end of term school holidays at our 3G all-weather facility. The aim is to focus on ball skills, while still providing a fun environment for youngsters. For some players, this ‘skills pathway’, where young players can develop their talent, might see them go all the way to the Rooks’ Men's and Women's first teams a number of years down the line. But for everyone who comes on these courses, they will pick up new ball skills and have a lot of fun too. 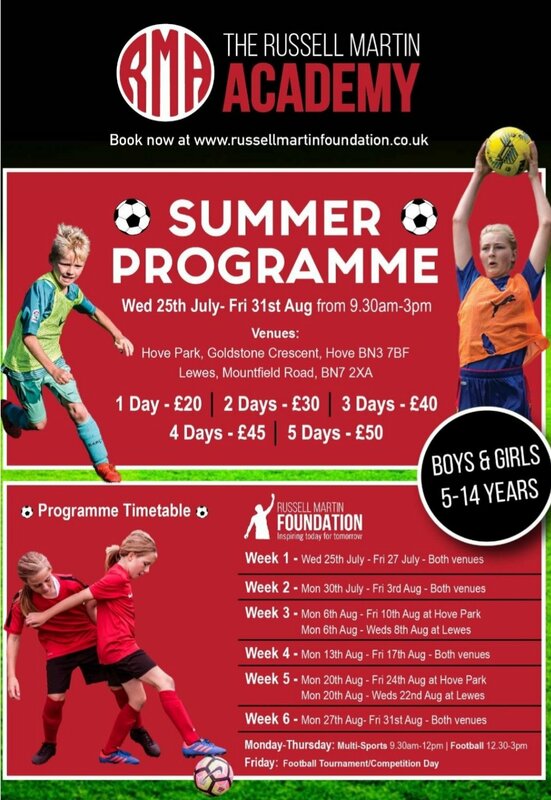 The sessions are run by our partners the Russell Martin Foundation and are supervised by experienced FA Level 2 and 3 coaches. Players will be split into groups of younger and older players. To get our discount prices, you should pre-book with us. You can book any combination from a single day to three full days. Booking: Pre-booking must include full payment. Photographs may be taken during the day, please tell us if you do not wish your child to be photographed. These pictures may then be used in the Club’s and Russell Martin Foundation's general marketing.